Kidal is a city in Northern Mali, on the southwestern edge of the Sahara. In this city in the desert, the Tuareg people live. Though nomads, the Tuareg briefly had a home after rising up and declaring the intendent state of Azawad in 2012, but less than a year later al-Qaeda swept in, then the French military. 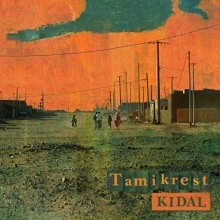 In this city torn by fights between governments and corporations, the rock band Tamikrest began in 2009. 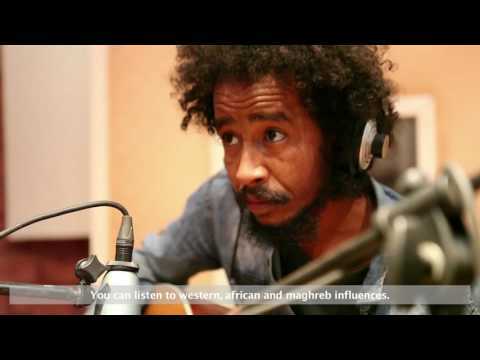 Now on their fifth album, Kidal, named after that city where it all began, the group still sings about the suffering and resistance of the Tuareg people with music powered by an insistent groove, snaking bass lines, and melodies blending influences of Sahel Africa, the Maghreb, and the West. Tamikrest wrote the majority of Kidal while in the desert, making sure they depicted and remembered the struggles of their people accurately. As in all of life, they witnessed both joy and pain, and the songs draw from these various emotions. Some tracks, such as “Wainan Adobat,” “War Toyed,” and “War Tila Eridaran” are more energetic and rock oriented, with driving percussion by the drumset and interweaving electric guitars that favor restraint and control over face-shredding solos. Many of the other songs are contemplative ballads. “Atwitas” is slow and intentional, with lead singer Ousmane Ag Mossa’s vocals about as deep and low as they get. With a faster tempo but entirely made up of acoustic guitars, vocals, and a soft, eerie background noise, “Tanakra” is the rawest song on the album, full of sorrow and foreboding. The final track, “Adad Osan Itibat,” has a much happier feel, with background percussion made up of soft clicks and snaps. Ag Mossa’s vocals are in a much higher register, and the accompanying acoustic guitar is plucked in a melodious, hopeful pattern with only occasional chords thrown in. 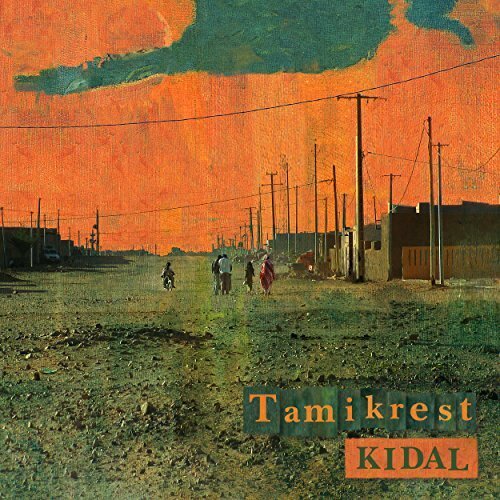 Tamikrest often talks about struggle, war, and the threats by companies and governments to the desert and the Taureg people, yet it is on this optimistic note that they end Kidal, hoping to bring change through defiance, resistance, and rock ‘n’ roll. Bear Family Records, the German company headed by Richard Weize, is well-known among collectors for its expertly remastered and superbly crafted LP-size box sets featuring extensive hardcover book-length liner notes by notable authors. Sometime last year (and somewhat under the radar in the U.S.), they began a new “Rocks” series on their CD line which, at last count, includes 31 titles (some bearing the series title “Rockin’ Rollin'”). Though these are single CDs, they are still housed in deluxe digipacs with beautifully illustrated booklets averaging 40 pages. 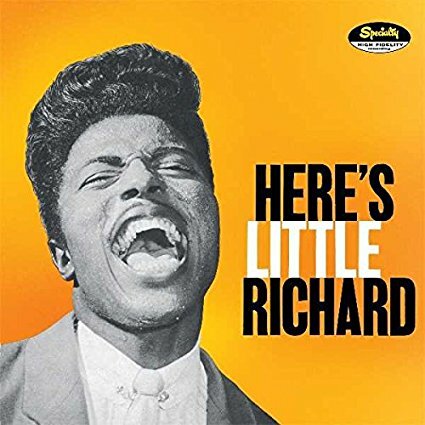 Each disc is devoted to a seminal artist from the formative years of rock ‘n’ roll, including major stars such as Jerry Lee Lewis, Bill Haley, Roy Orbison, Carl Perkins, and Ricky Nelson, along with many other rockabilly performers from the 1950s, some of whom have been largely forgotten. The rhythm and blues roots of rock are reasonably well represented, though some of the biggest names-Little Richard, Bo Diddley, and Chuck Berry-are conspicuously absent. No doubt the producers at Bear Family made a conscious decision to focus on lesser known artists whose recordings haven’t already been reissued and repackaged in every conceivable way, shape and form (though I’m still waiting for the ultimate Little Richard box set). The Black artists selected thus far for the series include Shirley & Lee, Frankie Lymon & the Teenagers, Piano Red (a.k.a. Dr. Feelgood), Screamin’ Jay Hawkins, Fats Domino, Amos Milburn, Lloyd “‘Lawdy Miss Clawdy” Price, and one of my favorite groups, the Cadillacs. Only the first two were sent for review, but I’m certainly anxious to get my hands on the entire set. At the dawn of the 1950s, Shirley Goodman and Leonard Lee were just a pair of teenagers from New Orleans’ Seventh Ward who regularly jammed together on a neighbor’s porch. One day they managed to talk legendary recording engineer Cosimo Matassa into cutting a demo for them, which Matassa later played for Aladdin’s owner Eddie Mesner, and the rest is history. They returned to the studio in 1952 and recorded their debut single, “I’m Gone,” backed by New Orleans’ finest session musicians, including trumpeter extraordinaire Dave Bartholomew (also credited as co-writer) and drummer Earl Palmer. The song hit #2 on the R&B charts, launching Shirley & Lee as one of the first male-female R&B vocal duos. The 31 tracks on this CD represent Shirley & Lee’s “rockin’, rollin’, carnival best,” from their 1952 debut (the final track) to the 1963 release of “Somebody Put a Juke Box in the Study Hall.” Most were recorded for the Aladdin label at Cosimo’s studio using his house band, which lends a distinctive New Orleans R&B flavor, partly attributed to the rollicking piano of Edward Frank, who played on most of the sessions recorded at Cosimo’s from 1956-1960. The final sessions in 1962-63 were produced by Bartholomew for Imperial, and feature Bartholomew and his band. I was surprised to learn how many of the songs were penned by Lee, including the megahit “Let the Good Times Roll,” (for which Shirley also received credit). In my mind, Lee was the greater talent, even though Shirley’s career lasted much longer. Shirley’s strident youthful voice, which no doubt appealed to teenagers back in the day, is an acquired taste, best sampled in small doses. Lee was the more polished singer, and the two seldom sang in tandem, preferring more of a call and response style (which nicely resolves the need to blend). Two other Top 10 R&B hits are included, the similarly titled “Feel So Good” (1955) and “I Feel Good” (1956). Other notable titles include “Rock All Night,” “Rockin’ With the Clock,” and “Everybody’s Rockin’,” all released between 1957-58 when rock ‘n’ roll was crossing over to the pop charts and fast becoming a worldwide phenomenon. 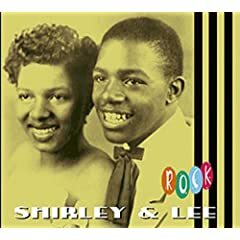 All in all, this is a very good introduction to Shirley & Lee’s rock ‘n’ roll oriented songs. The excellent liner notes by Bill Dahl provide a complete overview of their careers (both together and separate), while the detailed discography by Rick Coleman, Walter DeVenne and Richard Weize is icing on the cake. Anyone interested in delving further into Shirley & Lee’s recorded output should check out Bear Family’s 4 CD box set, Shirley & Lee: The Sweethearts of the Blues (BCD 15960 DI), from which these selections were drawn. “Here you will find a glimpse of the magic of a cheerful and grinning 13-year-old Frankie Lymon and his teenage friends making music that excited millions of fans all over the world.”-Peter Grendysa. Frankie Lymon & the Teenagers were the Jackson 5 of the ‘50s, an adolescent group led by an amazingly talented and extremely young artist. Lymon started performing at an early age with his father and brothers in New York. At the age of 12 he left the family fold to form The Premiers with neighborhood boys and achieved success on the local talent show circuit, leading to an audition for George Goldner’s Rama/Gee Records. They were quickly signed to the label, changed their name to Frankie Lymon & The Teenagers, and scored a major hit right out of the box with “Why Do Fools Fall in Love,” released in 1956. Their popularity soared over the next eighteen months, leading to television appearances, European tours, and a spot in the Alan Freed movies Rock, Rock, Rock (1956) and Mr. Rock and Roll (1957). Marketed exclusively to a teenage audience, they exerted a major influence in shaping the course of rock ‘n’ roll and inspiring other young singers, including Smokey Robinson and Mary Wilson. Unfortunately, fame was fleeting. Frankie left the group in 1957 for a solo career, and though he occasionally reunited with the Teenagers and both continued to record, neither produced any further hits. By 1960 Frankie’s voice had changed, he’d developed a heroin addiction, and rock ‘n’ roll was fast becoming the domain of white artists. Eight years later, at the age of 25, he died from an overdose. 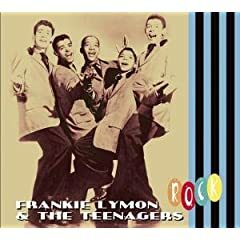 Frankie Lymon & the Teenagers Rock is a compilation that includes most of the hit songs recorded by the group, in addition to several of Frankie’s solo projects, and three sides recorded by the Teenagers following Lymon’s departure, with Billy Lobrano taking over the lead vocal. Among the highlights are “Why Do Fools Fall in Love,” “I Want You To Be My Girl,” and three more of their top 10 hits (“Out in the Cold Again” is the only major omission). Other enjoyable selections include “I’m Not a Juvenile Delinquent” (featured in Rock, Rock, Rock), “Baby, Baby” (with a smoking sax solo by Jimmy Wright), and “Fortunate Fellow” (accompanied by the Panama Francis Band), which was used for the soundtrack of Mr. Rock ‘n’ Roll. All of these tracks were taken from Bear Family’s 5 CD box set, Frankie Lymon & the Teenagers” Complete Recordings (BCD 15782 EI). However, if you’re looking for a single CD overview, Frankie Lymon & the Teenagers Rock is the best available compilation due in part to the extensive liner notes by Peter Grendysa and discography by Bob Hyde.